It’s Super Bowl time and everyone knows that Papa John’s will have a great commercial. And most people know that the first person Peyton Manning bro-hugged after winning the Super Bowl last year was Papa John himself, John Schnatter. But did you know that people who eat Papa John’s are the most interesting pizza consumers in the space? That’s right, when we analyzed buyers across the 4 major pizza chains across 69 different audiences – it became immediately clear that Papa John’s has the most stimulated customers. In 94% of the audiences, Papa John’s customers were the most engaged with passions spanning from sports teams to spending habits to science fiction. For example, have a look at the screenshot below taken directly out of SIGNUM for Restaurants. 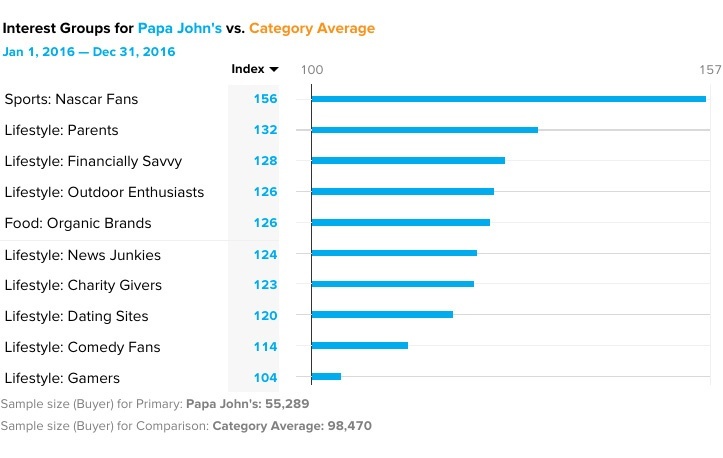 The data shows how Papa John’s customers over-index relative to those from the 3 other major U.S. pizza chains. That means Papa John’s customers are 56% more likely to be Nascar fans, 32% more likely to be parents, and so on. Papa John’s customers over-index 65 different times in this query of only 69 of the hundreds of audiences SIGNUM tracks. What's actionable here for Papa John’s? Even after the big game's over the pizza chain can reach customers with content around these specific non-sports passions through digitial media activation and social channels. Papa John's customers are so interested in the world – reaching them should be easy! Curious which competitors are eating a slice of your pie? Want to know who’s driving your revenue, and how to drive more? Quantifind can extract the signals you need from your data.